In a mixing bowl combine yeast, salt, sugar, oil and water. Set aside for 5 minutes. Add the flour and mix until it comes together. Cover with cling film or a clean dish towel and rest in a warm place for 1-2 hours.Turn out onto a floured surface and gently knock out air bubbles. Knead the dough until firm and shape into 40g balls. In a pot heat oil on medium heat and fry vetkoek 3-5 minutes until golden on each side. 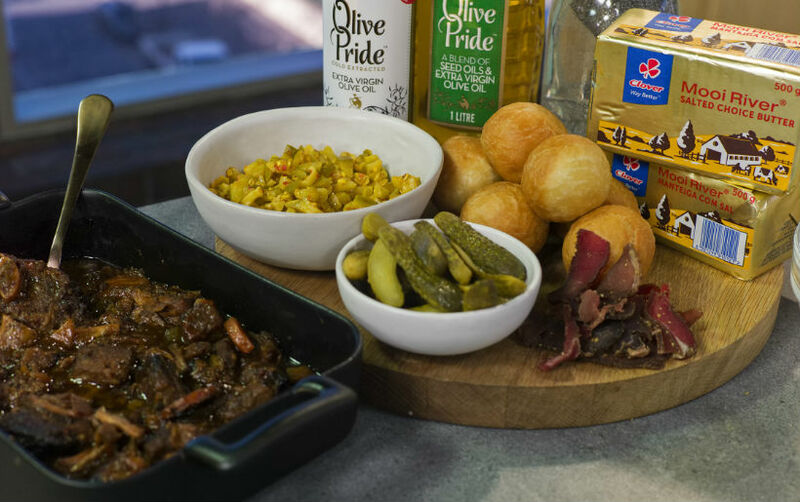 Serve vetkoek with some of the biltong butter, shredded beef, pickled cucumbers, atchar.